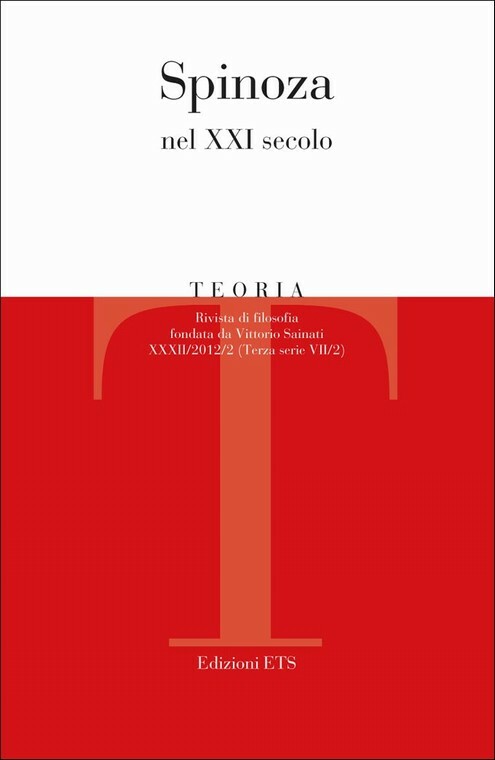 Accanto ai contributi dedicati al tema Spinoza nel XXI secolo, questo volume di «Teoria» presenta anche due testi di particolare interesse: uno di Dario Antiseri su Le ragioni della libertà (Lectio magistralis per il conferimento del premio «Vittorio Sainati» 2012, volto a segnalare la migliore tesi di dottorato discussa nell’anno precedente) e un altro di Dario Giugliano sulla riflessione di Aldo Masullo. Entrambi arricchiscono ulteriormente la rivista e ne estendono l’ambito di interesse oltre il rigido ancoraggio a un unico tema prefissato. Spinoza strongly rejects the traditional idea that the soul has a (mortal or immortal) seat, that is, he not only denies that the soul, in the case of death, leaves the body to reach another destination, but also that the soul dies together with the body. In order to understand Spinoza’s position, we have to turn to his theory of conatus, that is, the desire of each being, thus also of the body and the soul (the idea of the body), to persevere in its own being – a desire which belongs to the essence of each being. According to Spinoza, we are part of the infinite divine intellect because the eternity which is in God is also in things, thus also in our bodies and minds. Spinoza’s Principles of Cartesian Philosophy is often presented simply as an interpretation of Descartes’ Principia that does not reveal anything significant about Spinoza’s philosophy and its development. This paper, however, shows that Spinoza altered Descartes’ text in a way congruent with what he would later write in his Theological Political Treatise and the Ethics. More precisely, this paper concentrates not on what Spinoza added to Descartes’ texts but on how he presented them. The paper furthermore examines questions that were obviously important for Descartes but absent in Spinoza’s interpretation. Finally, this paper examines two concrete examples to show that Spinoza’s adaptations function as an unmasking of Descartes’ physics. The aim of this paper is to elucidate in detail what the Spinoza´s Copernican revolution means. Therefore, and following R. Misrahi, it deals with finding the foundations of such a revolution (relation or agreement between reason, nature and desire) and developing some of its consequences (apology of sensuality, critique of traditional morality founded in sadness, and ethical naturalism). This contribution analyses and discusses the problems regarding the Christology in the TTP. In particular, a confrontation is made between the thesis supported by Alexander Matheron (Christ as an exceptional philosopher who has elaborated the physical and metaphysical reasons supporting the position of the salvation of ignorant persons in a hypothetical version of metempsychosis) and the thesis defended by Shomo Pines (Christ as an ironical and contradictory figure provided ad hoc for rational Christians). It is necessary to combine these two positions. Spinoza’s Christ is a religious reformer but the reformation – the religio catholica – is immanent to the originary practice of the apostles. This reformer without success is also a philosopher: his mind is a powerful finite mode of the idea Dei. Christ has produced the knowledge of his historical situation. He is the projection of Spinoza in the past, an impossible Spinoza, an ironical and speculative figure, an anticipation without finality of the Spinozistic treatment/understanding of religion. This paper aims to reconstruct Spinoza’s approach to the problem of the body in his early Treatise on the Emendation of the Intellect (TIE). Firstly, I sketch out the general presuppositions of Spinoza’s conception, by examining the examples he provides through the work. Secondly, I focus on the relationship between imagination and intellect. From a general point of view, Spinoza views imagination as the source of error and does not consider it necessary for his own project to take into account more deeply the physical mechanism of the human body and its laws. Thirdly, I argue that this attitude is not totally consistent. On the contrary, the epistemological premises of the TIE would suggest the need to work out a more complete account of bodies and the human body in particular. In this sense, I view Spinoza’s further evolution as a rethinking of his early position which he reversed in order to develop it further. According to Spinoza an individual has as much right from nature as it has power to exist and act. In my article I argue that this thesis serves as a criterion to judge the effectiveness of the laws enacted by a state whatever its origin might be. Spinoza does not investigate the conditions on which states arise and receive their power, but he examines the conditions on which they preserve their constitution and fulfil their task to secure peace among men. Considering the power and the natural right of the individual the generation of states could be made intelligible only by surrendering this natural right to the state (critique of Hobbes). Therefore, individual power cannot be understood as ratio fiendi of the state. However, individual power is the very instance which an existing state has to take into consideration if the power by which it enacts laws should be the expression of a supreme and thus inviolable right. Because the state has a supreme right only if its power is the common power of the individuals, it ought to organize its legislative process in such a way that, by virtue of their own power, the citizens could approve of its positive laws. Individual power, therefore, could be considered as ratio cognoscendi of the optimal state. This inquiry into the “virtuous” role played by imagination not only in Spinoza’s Ethics, but also in the Theologico-political Treatise, often neglected by scholars, emphasizes, through the development of an active-passive dialectic within the functioning of Spinozian notion of imaginatio prophetica, the influence of some important chapters of Maimonides’ Guide for the Perplexed. Thanks to a comparative reading of the apparently enigmatic passages where the two philosophers deal with the iconic characters of Adam and Moses, will come into view Maimonides’ attention to some important issues concerning imagination which will turn out to be essential to Spinoza’s elaboration of the concept. Namely, on the one hand, the notion of imagination will prove to be, by both authors, a crucial component of human psychology, defining men’s condition ever since the Original Sin; on the other, the presence of a neat distinction between a receptive and a productive modality of imagination will turn out to lie at the basis of both accounts of the prophetic role, bearing important consequences mainly into Spinoza’s epistemology. Refusing the traditional concept of power as property of one person, as well as the Hobbesian theory of political representation, Spinoza holds that the actual power or state is inherently plural and that the participation of the multitude in the political deliberations makes them more rational and guarantees they will be in favour of freedom. However, despite being multiple by nature, the state presents itself as a unity. Otherwise it would be impossible to carry out the power of a multitude. This paper aims to show how, in Spinoza’s system, the plural nature of power as potentia is compatible with the representation of power as potestas, as something necessarily unique, by turning to the concept of «configuration» as used in Nobert Elias’ Sociology. The Theological-Political Treatise has traditional been read as a relentless attack on Judaism and its institutions and as a blanket rejection of theological claims to power and authority. However, for Spinoza the Hebrew theocracy, which cannot be taken in its hierocratic decay, offers the only historical model for true democracy. This essay tries to show their link in the context of his theological-political project. It has been argued that Spinoza’s philosophy has somehow contributed to Darwinism. His theory of the conatus, the striving for self-preservation, is believed to be an ancestor of, or even being identical with, the modern evolutionary notion of the «struggle for existence». Still, there are several problems with this association. In Spinoza, none of the elements now commonly thought of as distinctive of evolutionary thinking are to be found: descent with modification, natural selection, species change, heredity, variation, multiplication. The aim of this paper is to approach the issue “Spinoza and Evolution” from a different angle. As “Darwinism” is the product not only of Charles Darwin’s scientific labor, but also to a considerable extent of the popularization of his theory by the influential and popular writer Thomas Henry Huxley, it might be rewarding to take a closer look at possible traces of those innumerable Spinozist germs in Huxley. How are literary fictions possible in a necessitarian metaphysics such as that of Spinoza? Although Leibniz thought that the existence of novels was sufficient to refute Spinoza’s error and to prove freedom, I shall argue here that all fictions in Spinoza, including those that took a literary existence under the pen of a writer, actually own the type of metaphysical existence as “possibilities” that Leibniz thought it was impossible for them to have. To this end, this paper analyses Spinoza’s theory of fictions as exposed chiefly in the Treatise on the Emendation of the Intellect, and shows that although all fictions concerning a mode’s existence are indeed necessarily false, Spinoza does make true fictions possible when it comes to conceiving a thing’s essence, which in its turn saves literary fictions from metaphysical non-sense. The history of the Methodenstreit or the methodological controversy in the humanities and the social sciences has been told in various places over the years. Yet, there are still some interesting research positions left, like for example that of the hermeneutical circle of Hans-Georg Gadamer which in the twentieth century led to the dissolution of the Erklären/Verstehen distinction and to a reasonable proposal for a unified theory of method. In the age of information such a research method is every more necessary in order to create a real mental discipline; the ability to be critical and yet open at the same time. Hence the irreplaceable social function of philology, the most effective way to understand the “words” of others. Far from generating doubts, the constant habit to correct and complete one’s own opinion and that of others by comparing them is the only true foundation of an open and democratic society. This article seeks to explore a central question of Aldo Masullo’s philosophical thought, whose peculiarity consists in a critic of Husserl’s phenomenology and Heidegger’s existential analytic, both reformed in patosophy (starting from Viktor Von Weizsäcker’s concept of pathicus). On this level philosophy transforms itself into a practice of thought able to rethink itself and its conditions of possibility.